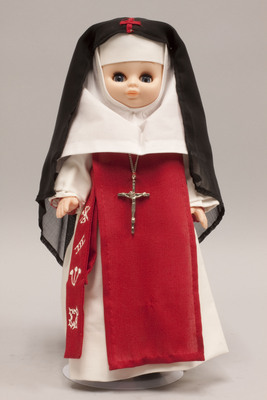 "Doll wearing habit worn by Sisters Adorers of the Precious Blood"
Plastic doll is wearing a habit typically worn by the Sisters Adorers of the Precious Blood, which was founded in Quebec, Canada, in 1861 by Aurelia Caouette. The doll is wearing a white habit with a white wimple, red scapular, and black veil. The veil has a red cloth cross appliqued on the front. A metal crucifix hangs from a metal chain around the doll's neck. A black rosary hangs from her waist.